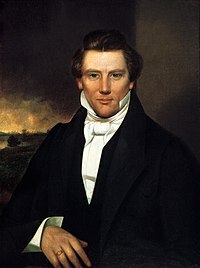 Joseph Smith Jr. (December 23, 1805 – Juin 27, 1844) wis an American releegious leader an foonder o Mormonism an the Latter Day Saunt muivement. When he wis twinty-fower, Smith published the Beuk o Mormon. Bi the time o his daith fowerteen years later, he haed attracted tens o thoosands o follaers an foondit a releegious cultur that continues tae the present.